‘Beneath Black Robes’ is Silber’s offering of remixes and re-imaginings of Detroit, Michigan virtuoso Sarah June’s latest album ‘In Black Robes’ and as an added bonus the majority of these remixes come courtesy of Remora’s Brian John Mitchell and Brian McKenzie of Electric Bird Noise. ‘Brand of Bitterness (Shoegaze Mix)’ expertly combines the drones and dark ambience of Remora with June’s childlike ethereal voice (reminiscent of Katie Jane Garside) creating a dreamlike, eerie atmosphere that complements both artists without one overshadowing the other. ‘Shadows Too’ however puts a stop to all that doom and gloom nonsense from before and channels ‘Moldy Peaches’ style simplistic lyrics and guitar chords. Sure, this track was recorded for a kids TV show and its light hearted jaunt is well intentioned but for the embittered cynics such as yours truly this was a long 1:37. ‘Bluesy Melody (Ridiculous Stereo)’ provides a similar irk too though by no means an un-listenable track, merely out of place and pale in comparison to the other remixes present. ‘Stagefright’ then works perhaps as the antithesis of ‘Shadows Too’, simplistic in its composition, it none the less simmers with passion with the distorted guitars’ repetitive riffs, making this live track hypnotic and spellbinding. ‘Ghost of Chevrolet’, mixed by Brian McKenzie, by far the most surreal rendition is also perhaps the most straightforward with the majority of the work coming from slowing down the track to turn June’s usually soft effeminate voice into a deep, slow moan, while a heavy bass guitar riff oppresses the environment with its lumbering tones. Silber would do well to keep hold of this artist, and maybe, just maybe, filter out the lighter elements as the mix of dark gloomy music and June’s voice is something pretty fresh and enthralling. Oh...a free download of remixes eh? Well, how about some history on the artist first? As a child, Sarah June played the piano and guitar most avidly, and began to write songs as a young teen. She dropped out of school at 18 to pursue a musical career, which she started playing live in Chicago and Detroit, before settling in San Francisco. She eventually bought a simple recording device, and started putting her signature sound songs (girlie whispers/ vocals set to simple and hypnotic sounding, yet intricately played acoustic guitar) to demo. She attracted the attention of the Hand/ Eye label, who released Sarah's debut album This Is My Letter To The World (which also saw some songs accompanied by sparse atmospheric keyboards) in 2008. This in turn attracted the attention of Silber Records, who offered to release her sophomore album In Black Robes. 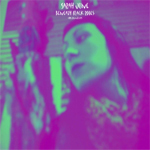 And yes indeed, a free download album of remixes of songs off Sarah June's aforementioned sophomore album, released in 2010. Well...that ain't completely correct, as two tracks are different: the electronic version of “Sophisticated Girls” was partof the ongoing International Email Audio Projekt, and “Shadows Too” is a previously unreleased song...showing the artist in original conditions with just voice and acoustic guitar, neither which were tampered with. But the other 10 songs on this digital album were remixed either by Sarah herself, Brian McKenzie (of Electric Bird Noise and longtime Silber collaborator – see part 1 of the Silber Records specials), or Brian John Mitchell (Remora, and Silber Records owner). Occasionally really weird stuff, like “Ghost Of Chevrolet” finding the track merely being played at reduced speed. Other songs get Hip Hop and/ or Shoegaze oriented remixes, with occasionally some of the vocals in reverse, like in album opener “Run Run”, for instance, which also gets additional drums and sees the acoustic guitar replaced by soft and sparse keyboards. “Brand Of Bitterness” gets a Noisy touch with a dark drone on top of Sarah's pixie-like voice. “Chevrolet (Remix)” again gets (Hip Hop-styled) drums, set as sole instrument on top of the vocals. “Stagefright” probably has some samples included, and also gets string keyboards set to the track, with some additional aerial static noises. “Colour Of Sound” was given an Oriental touch with samples from an Indian song mixed in the whole (that including drums, bombastic but still atmospheric keyboards) and Sarah's vocal parts cut up somewhat. I have to say, I simply hàte what the remixers have done to both “Bluesy Melody” and “The Reaper”. What (s)he did namely, is to have the music switch from one side to the other. And while that may be a fun thing to do, or even listen to on any normal stereo system, it really makes one go mad when listened to through headphones! For album closer “Saint Mary” drums (or drum machine) were again added, with also some weirdly deformed “strings”. Now normally we at Concrete Web don't rate remix albums (nor compilations or live albums, by the way), but I'd like to say that I was very much intrigued by this album...to the point of just enjoying it (along with other albums from the label, in all honesty) for days on end, delaying the moment of review to the max, and even dragging out time by quickly doin' other “important” things while still listening to the album over again, while I was in the actual process of writing these words! I can only say that I'm looking forward to hearing the new studio album Sarah is working on as we speak...and in spite of the two “horror moments” Beneath Black Robes WILL get a place in my 2011 year-lists! For now...remember this is a FREE download? Get busy folks!!! The brilliant finger-picking guitar playing of Sarah June is intimate but at the same time expansive in the way that Neil Young's playing is. The beautiful hymn-like quality of her songs are dark explorations of the blues that also hint at lounge jazz and motown soul. Sarah June is one of the most important solo artists to have emerged in the last decade. Mi perdonerà la Sarah June se a guardare distrattamente le sue foto che accompagnavano la press release, mi è venuto da pensare a una Suicide Girl con chiare aspirazioni musicali... confesso di essermi piuttosto sbagliato. Vero che il look eccessivamente goth della Sarah non si sposa benissimo con il suo genere musicale, ma chi siamo noi per giudicare un libro solo dalla copertina? 'In black robes' è il secondo album della cantautrice, che continua nel suo viaggio d'interpretazione musicale con la sua fragile e sicura voce da bimba (inevitabile il paragone con la Shaw dei Cranes) e una chitarra acustica in mano. Ciò che è notevole è come riesca non solo a intricarsi in melodie e arpeggi notevolissimi, ma di come la sua voce in poco tempo inizi ad attaccartisi alle orecchie per finire con il non andarsene più via. Questo è particolarmente evidente nell'orecchiabilissima Crossbones in your eyes, che vi ritroverete a cantare già al secondo ascolto. I pezzi della Sarah sono piccole storie di orrore urbano, scheletri, morte, amore e dispiaceri. Insomma, mentre i testi tengono piuttosto fede al suo aspetto, ascoltandola invece ci si sente stranamente sedotti e attratti da un mondo lontano e quasi fiabesco, fatto di creaturine dispettose e fatine. Mi rimane qualche dubbio sull'effettiva capacità della tenue e fragile voce della Sarah a portare avanti un intero album senza diventare eccessivamente stucchevole, ma per ora 'In black robes' mi ha pienamente convinto. Chiudo con una notizia di servizio: è attualmente disponibile, gratuitamente, sulla homepage della Silber linkata qui sotto una collezione di remix trip hop e shoegaze dell'album, intitolata 'Beneath Black Robes'. Par un facheux oubli, nous ne vous avons pas parlé du nouvel album de Sarah June, In Black Robes, pourtant nettement supérieur à son prédécesseur This Is My Letter to the World, bon disque qui n'avait pas su suffisamment se démarquer au milieu de la surabondante production actuelle de folk féminin. Mais en accentuant le côté goth décalée et en améliorant sérieusement ses compositions, la demoiselle s'impose progressivement parmi les noms à suivre (un nouvel album devrait arriver cette année). Et cet album de remixes confirme tout ce potentiel, même s'il a forcément tous les défauts inhérents au genre (en particulier le fait d'être très inégal avec son lot de titres peu supportables). Du délicieusement mutin 'Shadows Too' au très trip-hop 'Saint Mary', (avec une mention spéciale au 'Stagefright' qui fout d'agréables frissons dans le dos), il y a là à la fois un bon point de départ pour les néophytes et une agréable façon d'attendre pour les autres. ~ Dans le mur... du son!